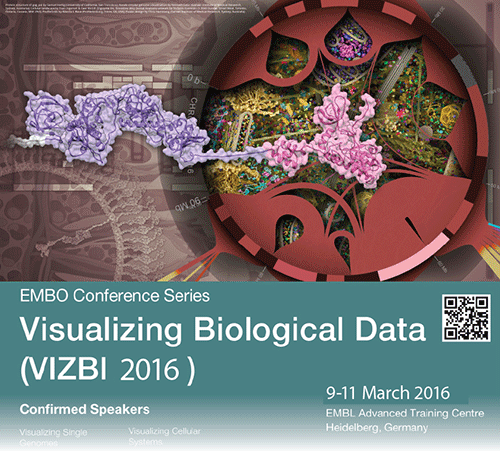 The 3rd EMBO Conference on Visualizing Biological Data (VIZBI 2016) - also the 7th international meeting on this topic - will be held 9–11 March 2016 at EMBL Heidelberg in Germany. VIZBI brings together scientists, illustrators, and designers actively using or developing computational visualization to study a diverse range of biological data. The conference features 21 invited talks that will review the state-of-the-art and challenges in visualizing data from genomes, transcripts, proteins, cells, organisms, and populations. Prior to the meeting (Tuesday, 8 March), there will also be tutorials on several visualization tools. All VIZBI 2016 participants have the opportunity to present a poster describing their work. Just before your poster session, you will be given 60 seconds and 2 PowerPoint slides to briefly introduce yourself and your poster to all VIZBI participants. If you cannot join us in Heidelberg, you will have the option of virtual registration, which allows participation in the conference (but not tutorials) via streaming video. To receive updates from the VIZBI organisers, you can join the VIZBI mailing list.